John Driscoll is an avid cyclist, mountain climber and all-around outdoorsman. In March, 2015, John was fishing fifty meters off the Mexican shore when a sudden micro-squall tipped the small boat on end, dropping him 12 feet to the stern and fracturing his back. Alert resort staff stabilized him and within three hours he had been airlifted to a Tucson trauma center. Expert surgical care combined with John’s superb physical condition contributed to an amazingly quick recovery. 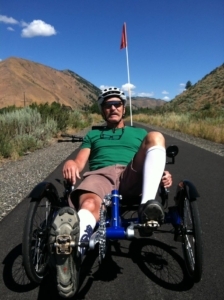 Barely three months from the accident, John and his wife Kate visited RecumbentPDX from their home in Idaho. They had determined that cycling would be integral to his continuing recovery, but weakness in his legs ruled out his upright bike. After a day of test riding, he chose on an HP Velotechnik Gekko. Remarkably, John needed absolutely no adaptive components – the bike left the store virtually stock.